Remember the Orphan Blocks I showed you yesterday? Well these little Sues are getting all dressed up in Pink. Now tell me, how do you quilt Sunbonnet Sues?? Last year I found these orphan blocks at a local Quilt show. I've never made a Sunbonnet Sue before, so I thought it would be fun to finish these up and make into a small quilt. The blocks were easy to machine applique (I even changed a couple of the bonnets to coordinate better). Have you ever worked on orphan blocks that were made by someone else? I received a little package in the mail the other day. My sweet bloggy friend Leslie from MarveLes Art Studios sent me a little gift. Leslie creates such beautiful things with fiber and thread. Thanks Leslie. Keep up the amazing work. 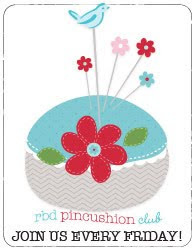 Did you know that Riley Blake is having a weekly Pincushion tutorial FREE on their website?? I already see a couple that I'd love to make. So come on! Join the club!! Will you make all 52???? Have you seen the sweet pink goodness over at Cluck Cluck Sew?? It's a Pink Classic Hourglass quilt and you can find a tutorial HERE. And being that I am a Pinkaholic, I just had to dig out some pink and brown fabrics and make my own version. I received this very sweet note from Kasey's Grandmother, and wanted to share it with all of you. Hello! 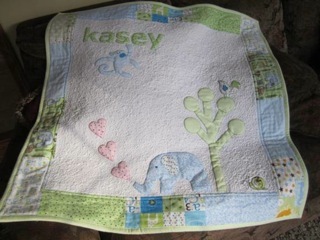 This is Kasey's Grandma, blessed recipient of the beautiful "Kasey" quilt. Gifts are wonderful expressions of love. Some gifts, those that are conceived in the heart and lovingly fashioned, hold special value. When I first saw this lovely quilt, I cried, tears of joy and gratitude and marvel, for a friend who gave her time, talent, skill and love, and fashioned this treasure. I also treasure the many prayers and encouragement I have read here today. Thank you! Thank you, Michelle. 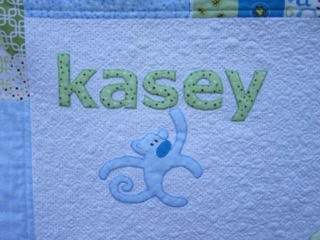 Thank you so much for your very sweet comments about the quilt that Michelle made on THIS post and prayers for little Kasey. On a happy note, I went to JoAnn's yesterday and exchanged the yarn. Thank goodness I had not gotten very far before finding the separation. So I am about to re-start working on the scarf. Just so you know, they have a beautiful selection of colors to choose from. At least until they are all sold out. AGAIN! AND please pop over and visit my friend Leslie at MarveLes Art Studios. Leslie is giving away two beautiful pins. Leslie makes such gorgeous things with fiber and fabric. I love to read her blog and watch her build amazing things with thread designs. She also has lots of suggestions on how to use the different feet on your sewing machine. Enjoy bringing in Spring with a Happy Quilting day!! On Saturday, on my way out of JoAnn's I noticed a lady doing a demo. I walked over and watched as she unraveled ribbon yarn. Now I am mostly a beginning knitter, but I watched as the lady walked through the technique to make a ribbon scarf. And I think I got it. It took me a couple of times to figure out how to get started but slowly I was winding my way through this yarn. When I was thinking about writing this post, I was going to give my glowing report on this ribbon yarn and how reasonable it is at JoAnn's ($4.99), but today I will have to make the trip back and see if they have another skein (they were all sold out last week). I figured it was time to replace the tablerunner that graces the table in our front foyer. The Christmas one that I love so much needed to be put away until next season. So I found this pattern at the Fiskars site and dug out my pretty batiks. Do you have grandchildren?? I have not yet been blessed with my own grandchildren, but there is another kind of grands in the quilting world. Several years ago I taught my BFF how to quilt. We have enjoyed our quilting times together even though she lives 1100 miles away. Together we have ventured into new patterns, quilt shows and shop hops. I wanted to send these pictures that Michelle sent to me. She wanted to learn how to applique, so she watched Youtube videos, and checked out websites. This was her FIRST attempt-for a good friend who is the grandmother of a very seriously ill baby. She wanted the grandma to have a quilt since she watches little Kasey so much. She gave it to her the other day. 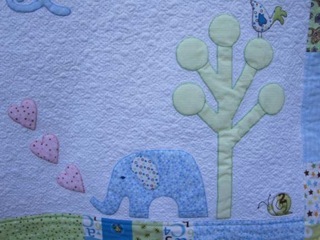 I thought you'd enjoy seeing what your 'grandchild' in the quilting sense is doing. She's WAY beyond me!! 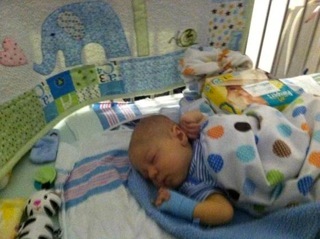 Baby Kasey at the Clinic where he had just had a liver biopsy (2/29). Scheduled for liver surgery on 3/7. He has already survived two brain surgeries; the doctors are all amazed at his progress. Pretty impressive, huh?? I am so thrilled to see the love of quilting being passed on and able to bring comfort to others. So maybe I do have some grandchildren out there :-) How about you??? Do you have an orphan block sitting around somewhere?? A block you could send for a very special project. As I was catching up on my blog reading this morning, I read on Blushing Rose about a need. A need for a quilt for a little girl who has a brain tumor. I quickly jumped over to Suzanne's blog and to Anne's Blog to find out the details. Going through my stash of fabric I quickly made up three blocks to send for this Quilt of love. Won't you take a minute to either find that orphan block or make a 6 1/2" block to send. It will be greatly appreciated and you will be greatly blessed! Am I a Bag lady?? It all really started so simply when I would find a pattern and fabric for the pattern. It only made sense to keep the fabric all together in a bag. It started in the bag from the LQS. and the free giveaway bags from the Quilt shows. How about those large oversized zippy bags. Then my dh came home with canvas bags from a convention he attended. These were even sturdier and had handles that could hold weight! Before I knew it, I was over run with project bags. So have I become a bag lady?? There are so many projects that I have in mind, but they just end up in a project bag! Before I can get the first project started, I am drawn to a new one. Oh my! Am I the only one dealing with this dilemma?? I finally finished this quilt, which is a gift for an acquaintance who has serious health issues. She has been very generous in gifting me with her home made jams and freshly canned fruit. She is no longer able to do these things. I hope she will enjoy this little token of love. Last week I mentioned that I was going to try machine quilting with my sewing machine in this positon. I did like that I did not have to wrestle with my fabric as much, but to me, it was harder to visually follow the quilting. So in the end I will go back to quilting the regular way. I'd love to hear if anyone tries this. Maybe it just takes time to learn the feel of the machine. And it might be easier if the machine was level with the table. Amy (A Quilting Sheep) sent a link for a youtube about building a table. Has anyone ever made this table? If you enjoy making paper crafts, you will find a wealth of free templates at Mirkwood Designs. Lots of well-designed papercraft projects – both practical and fanciful to keep little and big hands creative. Ruthann also has a beautiful blog Adventures in Creativity that I think you would enjoy. Paper designs, knitting, recipes AND quilts :-) I have not listened to her podcasts, but I'm sure they are interesting. How many letters do you really need??? Okay, tell me I am not the only one. But is Word Verification driving you to distraction!!! I'm learning how to read the funny letters, but is it really necessary to have these foreign characters just to leave a comment?? Madame Samm has some great information if you want to turn yours off. Check it out at Sew I Quilt. And thank you for all of your comments yesterday. It was fun participating in a one day giveaway. So who won my Leap Day Giveaway?? The Random generator picked Rhonda D. From Ozark Country Stitchin'. Rhonda, please contact me with your mailing info. I do not see a way to contact you, but you did sign up for email updates. If I don't hear back from you by Saturday, I will draw a new winner. Now be sure to check out Pat Sloan's blog as she and Bonnie Hunter are having a very fun giveaway.